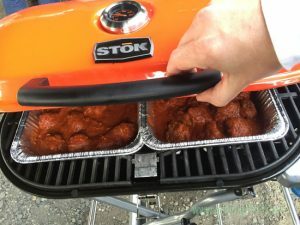 A big dilemma that most folks have is what type of grill to use for tailgating. Do you lug a big Weber kettle? 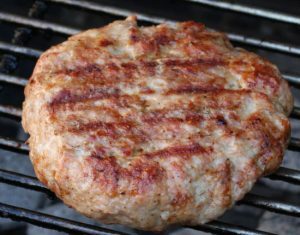 Do you use a mini Smokey Joe? Do you settle for a Weber Q propane setup? Well here is another option and this is a good one. The Weber Smokey Mountain BBQ smoker can be easily modified to be used as a small and very portable charcoal grill. On the web this is commonly referred to as the “Little Black Egg.” Isn’t that clever? 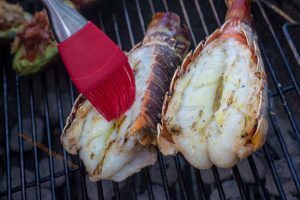 A nice play on the Big Green Egg grill that so many people love to grill on. To first understand how this works you need to see that the Weber Smokey Mountain (WSM) is comprised of three major pieces. A bottom (where the charcoal and smoke wood goes), a middle area (where the middle grate and top grate sit – when you are smoking), and a top dome. All you have to do is remove the middle section. This shrinks the smoker down to what looks like a little black egg! If you look in close to the above picture you’ll see a charcoal ring. This comes with the smoker and helps keep the large amount of coals away from the vents and helps with air flow. I like to use this for the little black egg setup because the grate can sit right on top of the ring. If you look closely inside the smoker there are three bolts which hold the legs on the smoker. This is a problem. If you use these bolts to rest the grate on you will have a wobbly grate. Using three bolts to rest a grate on isn’t too secure. However, the charcoal ring allows the grate to sit just below these bolts and provides for a nice secure foundation for the grate to rest on since there is grate support all around. Another nice feature of the little black egg is that you have three air vents at the bottom. This allows for a lot of air flow control compared to the typical charcoal grill which has one vent at the bottom. My only problem with the little black egg is that the dome of the smokey mountain smoker does not have an adequate ‘lip’ to rest safely on the bottom portion of the smoker. It is designed to have a middle section, which has the appropriate lip to fit snug with the top and bottom pieces. This isn’t the end of the world but it does mean that you can have the lid slide off if you aren’t careful. I’ve never had this happen but it is possible for the lid to slide off if bumped since the pieces sit on top of one another with the same dimensions. Normally a charcoal grill dome will be a bit larger than the base to allow the dome to sit snug on top. Not here. Both pieces are the same size. No big deal; just be careful. One of the main reasons I wanted to use the little black egg setup is that we needed a high charcoal heat at the tailgate and we needed more surface area. The Smokey Joe is a great little grill, don’t get me wrong. But you are simply limited with the small grate surface area. The pictures above show my Weber Smokey Mountain which is an 18.5 inch. This is the small version. The 22 inch model also works well for this. For my first time trying out the little black egg I grilled a blue cheese burger. I had a burger patty that was sitting in the freezer for a while. It had a simple peppercorn dry rub on it already and I had some extra blue cheese sitting around. I lit the coals by putting a small piece of newspaper under a charcoal chimney. I let the coals catch on fire and then dumped them over one half of the grill. The burger cooked easily over direct heat. I moved the burger to indirect heat and added some blue cheese. I closed the dome to melt the cheese a bit. Yup it worked well! I’m pretty excited I found out about this little modification to the WSM. The little black egg is easy to fit into any car and has much more surface area than the standard portable grills. Below are a few tailgating pictures from M+T Bank Stadium in Baltimore. I took these with my cellphone at the tailgate. The first shows the charcoal chimney being lit and the second shows a grill full of grilled Taylor Pork Roll, English Muffins and a cast iron skillet with eggs. Disclaimer: These opinions are my own. I am not endorsed to say any of the above. I just happen to think that using a Weber Smokey mountain as a charcoal grill is a pretty good idea.